A Connecticut woman has filed a lawsuit against Harvard University for the "wrongful seizure, possession and monetization" of two photos of slaves who she claims were her ancestors, USA Today reported. On Wednesday, Tamara Lanier's lawyers filed the lawsuit in Middlesex County Superior Court alleging that the university has ignored her requests to "stop licensing the pictures for the university's profit." She has also demanded the university to turn over the images of Renty, an African man, and his daughter Dalia. "Harvard's refusal to honor our family's history by acknowledging our lineage and its own shameful past is an insult to Papa Renty's life and memory," Lanier said, according to USA Today. Lanier, who lives in Norwich, is represented by civil rights litigator Ben Crump and attorney Josh Koskoff, of Westport, according to The Associated Press. The woman is seeking an unspecified amount in damages. What's the history of the photos? The images, which are owned by the university, are believed to be the earliest photos depicting slaves in America. In 1850, Swiss-born Harvard professor Louis Agassiz had a series of images, known as daguerreotypes, taken of Renty, Dalia, and more than a dozen other slaves, according to USA Today. The slaves were stripped naked and photographed from different angles. Agassiz used the images to promote his, and others, belief that black people were inferior to white people and to support slavery. The photos disappeared for more than 100 years. But in 1976, a Harvard museum researcher rediscovered the images in storage. 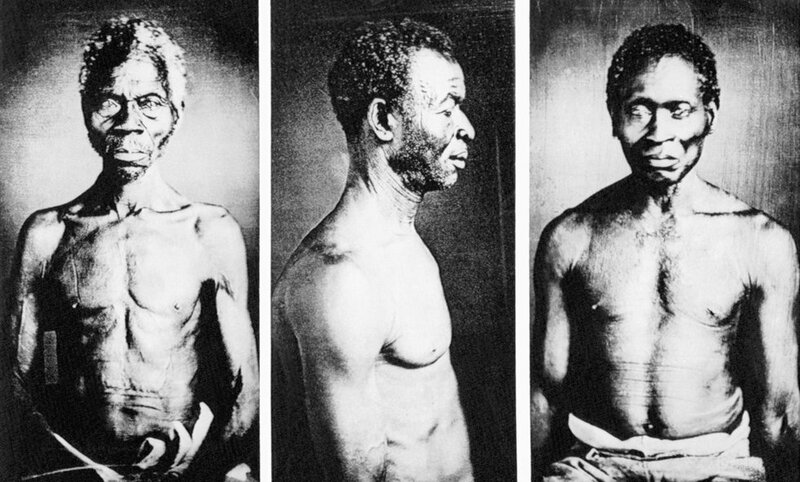 A photo of Renty, which has become iconic as the face of slavery, was used on the cover of, "From Site to Sight: Anthropology, Photography and the Power of Imagery," a book published in 2017 by the Peabody Museum. Harvard sold the book online for $40. Lanier claims that Renty is her great-great-great-grandfather and that she grew up hearing the stories of "Papa Renty," who was enslaved in South Carolina. "My mother made sure that not only her children and her grandchildren, but everyone, knew the stories," Lanier told the AP. Composite Portrait of Slaves – Renty is depicted in the image on the left. Lanier allegedly wrote letters to the university on two occasions and explained her familial connection to Renty. In 2011, she claims that she asked the school how the images would be used, and in 2017, she demanded that the photos be turned over to her family. The school responded to both letters but she said it didn't grant her requests. The lawsuit spells out eight separate legal claims, according to USA Today. It cites federal law over property rights and the Massachusetts law for the recovery of personal property, among others. "These images were taken under duress and Harvard has no right to keep them, let alone profit from them," Koskoff said, USA Today reported. "They are the rightful property of the descendants of Papa Renty." It also points to the 13th Amendment and claims that the university's possession of the images "is a continuation of core components or incidents of slavery." The lawsuit cites a separate state law which claims the university has used the name and photo of Renty without permission. "For years, Papa Renty's slave owners profited from his suffering – it's time for Harvard to stop doing the same thing to our family," Lanier told USA Today in a statement provided by her lawyers. What did Harvard say about the lawsuit? Harvard spokesman Jonathan Swain told the AP that it "has not yet been served, and with that is in no position to comment on this complaint."